The LASP Mission Operations & Data Systems (MO&DS) group staffs several Mission Operations Centers and Science Operations Centers for the day-to-day operations of NASA spacecraft and instrument missions. 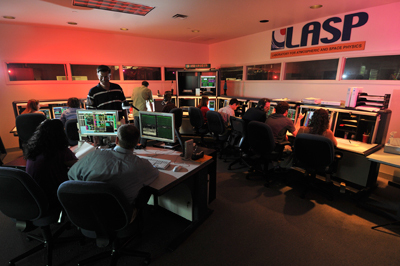 LASP is one of only a few university-based mission operations centers. We train and certify undergraduates to perform mission operations for NASA satellites totaling more than $1.5 billion in value. Our highly skilled mission operators monitor and control the spacecraft and their on-board scientific instruments; software engineers and scientists process, analyze, distribute, and archive the mission data; and create the software to support MO&DS activities. Each day, more than 100 gigabytes of data come through LASP servers to support ongoing space missions, as well as the scientific data that scientists from all over the world rely on. LASP experts ensure fast and accurate data transfer, management, and archiving, as well as the development of software tools that support scientific data users. Click on the image to view a PDF (2.1 MB) of LASP Mission Operations & Data Systems.